We started out by simply having a baked potato bar for lunch about once a month, with bacon, broccoli, and cheese as our typical toppings. Then we started trying baked sweet potatoes with toppings, and those were pretty tasty too. And eventually, this recipe was born of wanting to have baked sweet potatoes with toppings (i.e. whatever was in our fridge at the time, which happened to be chicken, bacon, and mushrooms), but not wanting to wait the hour plus for the potatoes to actually bake. So I decided to roast them instead, and the results were delicious. Toss chopped sweet potatoes with olive oil and spread on baking sheet. Roast at 375°F for 30-40 minutes (depending on the size of your sweet potato chunks), stirring halfway through. Meanwhile, in a large skillet, cook bacon to desired crispiness. Remove from pan and cook mushrooms in bacon grease. Chop bacon once it has cooled slightly. Add cooked chicken to pan with mushrooms to heat through. 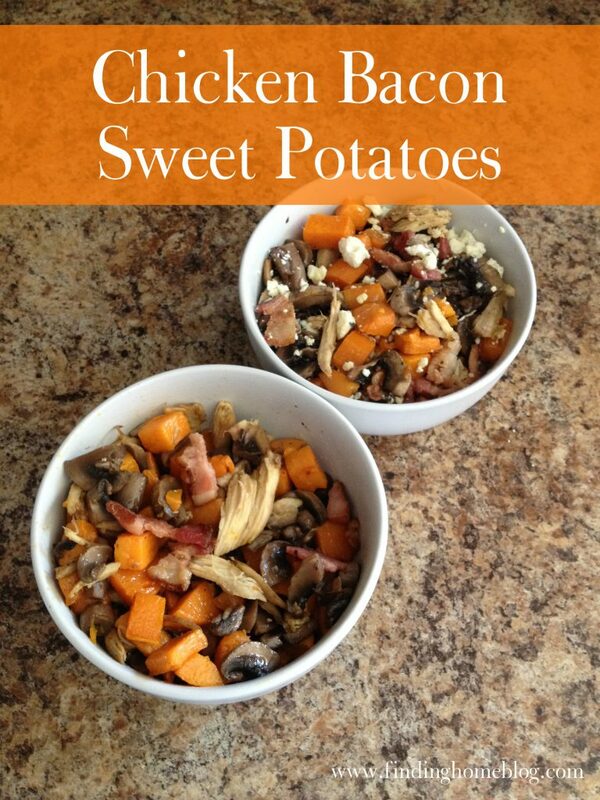 Serve by portioning out sweet potatoes and topping with chicken, bacon, and mushrooms. Garnish with your favorite cheese. This recipe is also suitable for a Whole 30 if you leave off the cheese. But wait! There’s more! If you’ve enjoyed the recipes I’ve posted on this site, here’s a chance for you to have them in your kitchen whenever you want. My husband Jesse and I have four children. When our daughter Hannah started eating table food, she also started having digestion issues. After about six months of trying different things, including an elimination diet, we discovered that she has non-celiac gluten intolerance. This means that gluten makes her very uncomfortable, but it is not as bad as an allergic reaction. A year and a half later our youngest, Elizabeth, started showing all of the same signs. For us, this means that gluten is still present in our home, but the girls don’t eat it. We have soups and stews with a side of biscuits or breadsticks for those who can have them. We have two boxes of crackers in the cupboard – wheat and gluten free. Most of our main dishes are gluten free because it’s easier for me to just cook one meal. We are a mostly gluten free home. 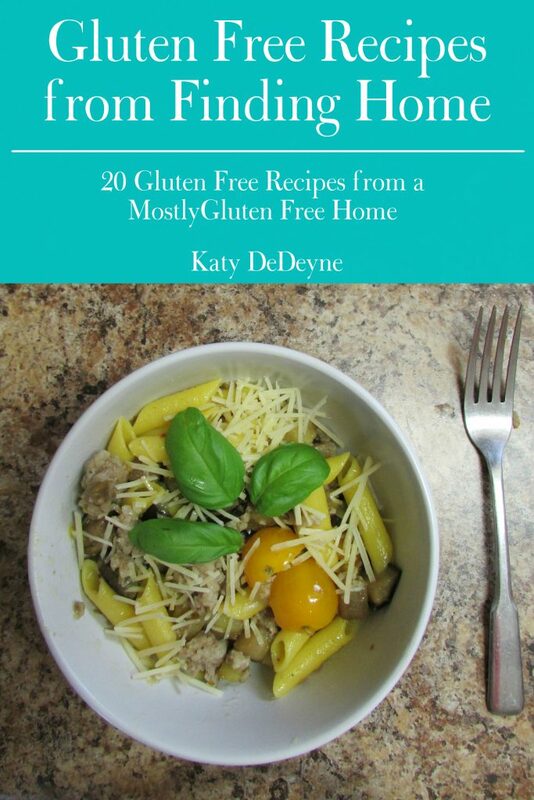 Whether you’re gluten free or not, I hope you’ll enjoy these recipes. The food I make is simple, real food, with a short list of ingredients. It tastes good, and it’s filling, but it doesn’t cost an arm and a leg to make. If you want yummy meals? I’ve got you covered. On a budget? You’re in the right place. Just looking for simple food to cook for your family? Come on in. And it’s free! Go here to get yours.